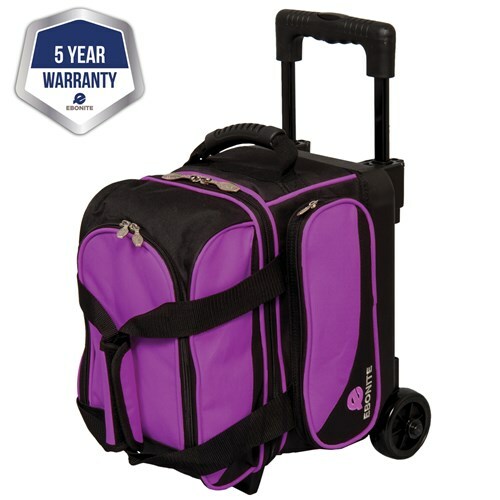 Every Transport I Series wheeled bag has an over-sized accessory pocket, smooth thru-wheels (perfect for rolling in bowling centers), and an extendable square handle and a separate shoe compartment. How far down does the handle retract? The handle will retract in flush with the top of the bag. does this bag hold shoes size 11? This bag will store up to a mens size 10. This roller will have 3" wheels. Dimensions are 22" x 18" x 12". The handle is 35 inches when fully extended. Do the handles lock when extended? Yes, the handle will lock when extended. Is the warranty two year as shown in the specs, or 5 year as shown in the add's pictures? The warranty is for 5 years. Due to the time it takes to produce the Ebonite Transport I Single Roller Purple ball it will ship in immediately. We cannot ship this ball outside the United States.